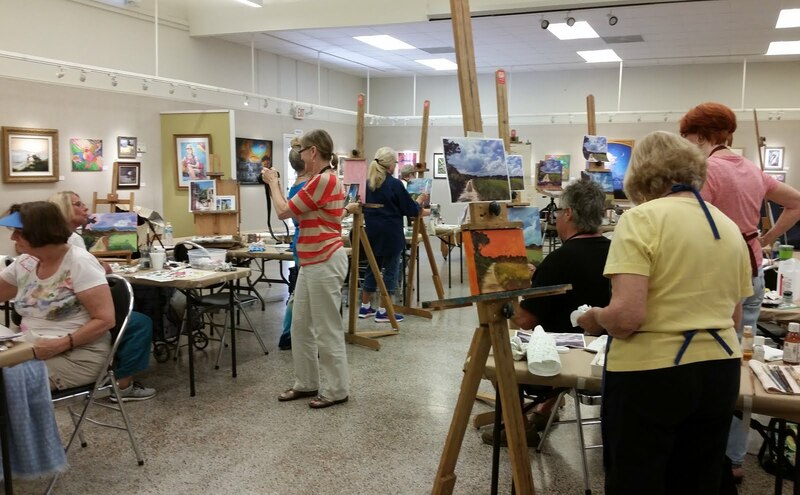 I went to an art workshop this weekend and I really enjoyed it. It was being held by St. Augustine artist Ray Brilli at the St. Augustine Art Association. He is called the "High Voltage" artist. I like the way his paintings do look high voltage and so decided to go. I took away several good points. The first is everyone who wants to make vast improvement in their art should buy the video "EN PLEIN AIR: PAINTING ON THE RIGHT SIDE OF YOUR BRAIN" by Rick Howell. It costs $80 but well worth it! (Amazon) Our instructor played it for us and yes, I bought it as well. Mr. Howell, now sadly deceased, was an outstanding New Mexico/Colorado artist who was famous for his beautiful landscapes. Largely self taught, he became very adept at painting landscapes and breaking them down into simple shapes that evoke great emotion. He sums up how to do it in the video. Believe me, it is well worth the money, much better than books. Our instructor said it was the best purchase he ever made. Judging from his work, I'd agree! To help you decide, you can google RICK HOWELL, artist. The site has his biography and photos of his art. Wonderful! It is very important to paint shapes. To do that we SQUINT! We then see just the shapes and colors/values in the scene before us and are not distracted by all the details that can ruin the painting. That is what this workshop was all about and I found it quite exciting and enlightening! 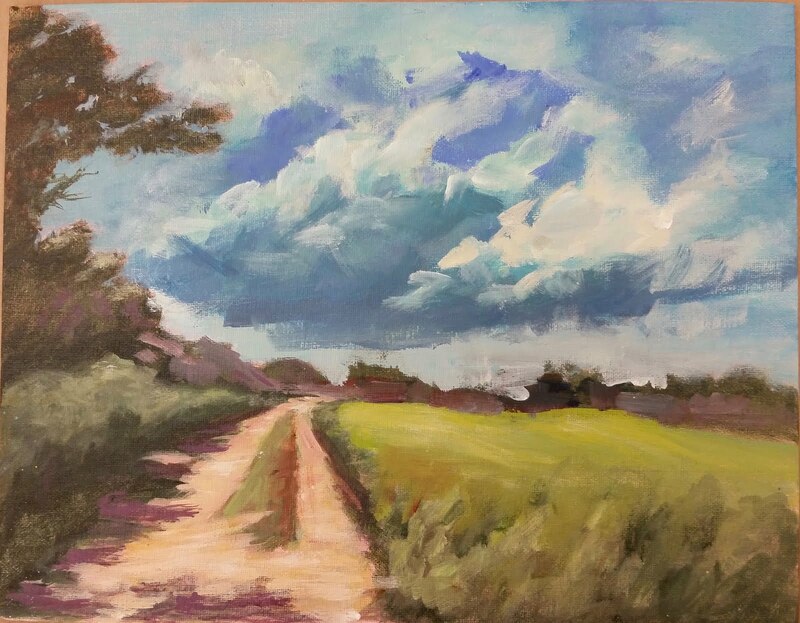 It allows you to loosen up the brushstrokes and pare down to the essentials of the color and shapes. We had a photo of the landscape in both color and black & white. The B & W was for tonal values of course. Both were 8 x 10. Our canvas was 11 x 14. We used a T-square to make a grid of the photo and then made the same grid on the canvas with water color pencil (only). From that grid we transferred the drawing on the photo to the canvas in the correct proportions. Nice! I'll show how it is done in my next blog. Yes, I am posting the paintings we did in the workshop. Hopefully they won't disappoint. 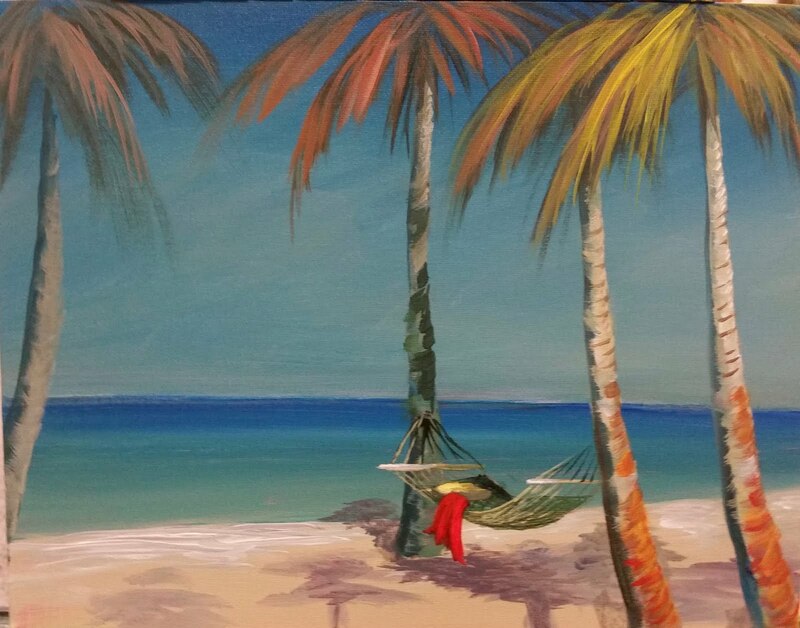 The first painting is of an area here in St. Augustine close to the shore of Matanzas River. It is an old dirt road by a grassy field that is now only used as a foot path or hiking trail. Simple but lovely with storm clouds gathering overhead. The other two are fun exercises in ramping up the "voltage". 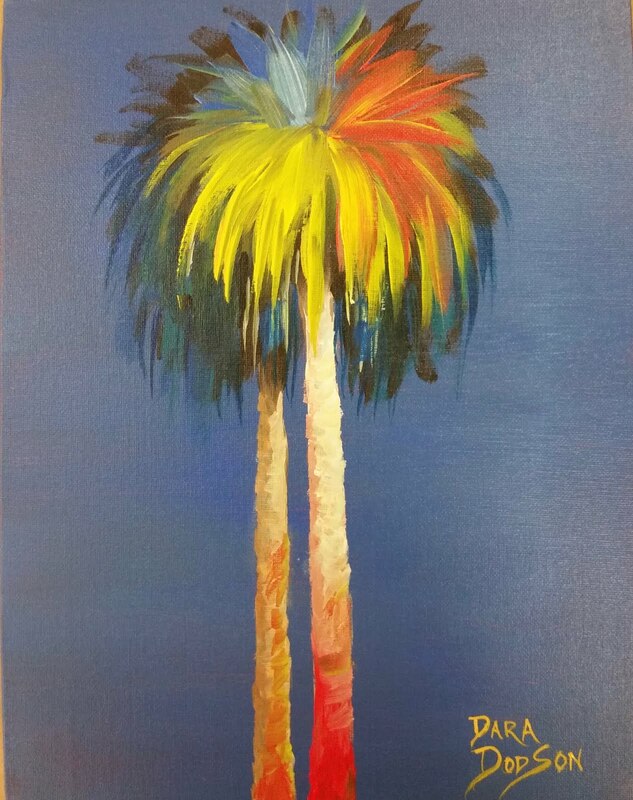 Ray loved my psychedelic palm trees and suggested I do a series with the same trees but different color backgrounds. But of course I will! Enjoy, and Thanks again for looking! There were 10 people in the workshop. The instructor is in the black shirt in front of the lady in yellow. His name is Ray Brilli. The photo we were painting is above the canvas he is working on. Incidentally that is my painting on the left wall above the head of the lady in the white shirt. Below are the three paintings I completed during this workshop.